The Rothschild’s giraffe formerly considered a subspecies of the unique giraffe species now its taxonomic classification changed to an ecotype of the Northern giraffe and part of the Nubian species according to a new genetic research made just in 2016 which led to the taxonomy reorganization of the whole species. The Rothschild species is one of the tallest giraffes. They can be an astonishing 19 feet in height and weigh about 2,500 pounds with the males weighing more than the females by several hundred pounds. You will notice that the coloring of the Rothschild Giraffe is unique when compared to the other species. Their coat consists of dark brown and dark orange patches and then areas of beige through them. Their markings stop at the top of the knee caps, below that area the spots disappear, and everything below that point down is whitish. The Rothschild’s giraffe measures 16 to 19 feet height and reaches a weight of 1800 to 2500 pounds, with males being larger than females. It is an impressive height. However, it is not the highest giraffe. It is often confused with the Masai giraffe (Giraffa camelopardalis tippelskirchi), but with careful observation of its coat design, can be distinguished from this and other species. The spots on its skin are large and with different forms, with a combination of two colors ranging from a chocolate brown in the center fading to a less intense brown color at the edges separated by a thick border. The background skin color is cream or yellowish, which makes these patches stand out and give it a very elegant appearance. In the legs, the spot pattern fades until completely disappearing below the knees until the feet. The distinction of the spots between the different giraffe species may seem complicated, but if compared and observed at the same time, you can notice the peculiarities of each design and learn to identify each species. Rothschild’s giraffe has a vertical mane of a dark brown hair which is visibly striking and beautiful. They are born with two ossicones, but due calcium accumulations, it can give the impression of having three or even five of them. Two in the same place as other giraffes, one in the center, and two behind those. However, these additional ossicones are smaller than the others. 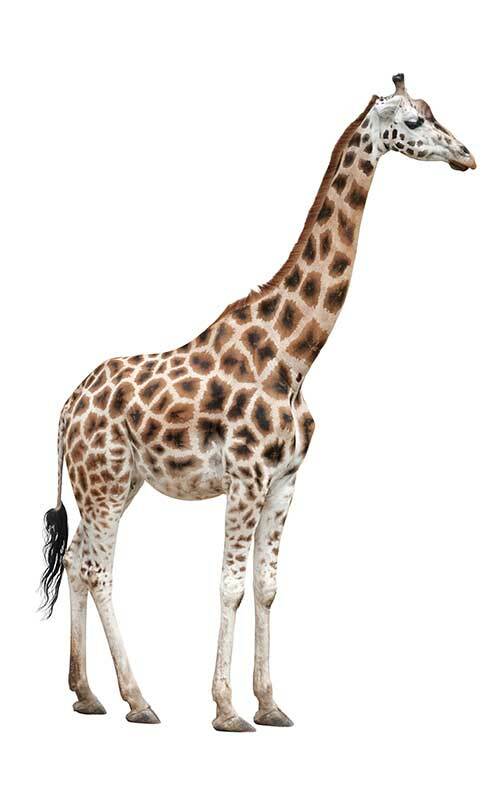 It is hard to believe looking at it, but the neck of any giraffe has the same amount of vertebrae as humans, seven. The body of these giraffes is designed to give it speed, power, and agility. There are very few animals this size that can move so swiftly. They have amazing sight, allowing them to see predators from far. They have a fantastic sense of smell and hearing too, so they are always alert to what is going on around them. They have a long tail that helps to keep pests such as flies away from them. Rothschild’s Giraffe – Giraffa camelopardalis rothschildi. Giraffes are related to deer and okapis. You may not think so looking at them, but history could indicate that these giraffes were once shaped more like deer. They grew their long necks out of necessity, and as a result, the rest of their body had to grow as well. Giraffes and okapis split from a common ancestor around 11.5 million of years ago. Like all other giraffes, the Rothschild’s giraffe lives on the African continent. Specifically, they inhabit the hot woodlands, savannahs, and shrublands of Kenya and Uganda. Lake Baringo in Kenya is the common area where these giraffes live. 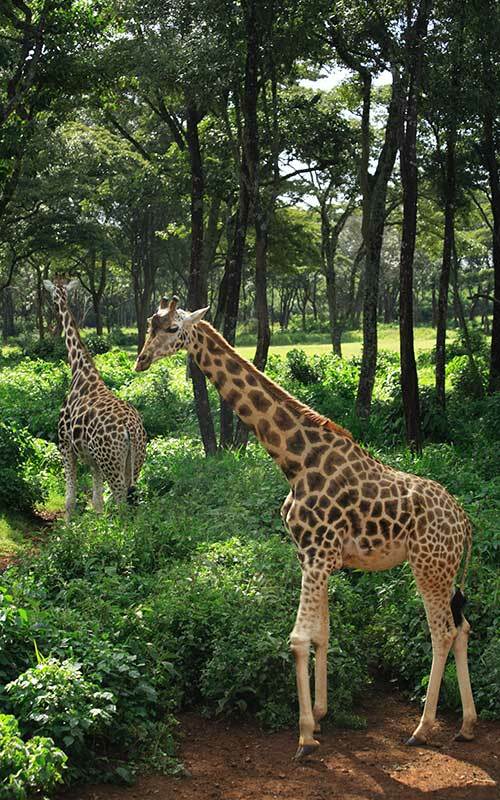 In fact, many of the people refer to them as the Baringo Giraffe. Most of them live on one of two wildlife refuges in Kenya like the Lake Nakuru National Park while other populations of this species inhabit in the Eastern parts of Uganda in the Murchison Falls National Park. They are herbivores like all types of giraffes and feed on the leaves of tall trees such as the acacia or wild apricot. They also eat sprouts and fruits. Their great tongue helps them to reach the leaves whose stems are covered by thorns without hurting themselves. They spend several hours feeding during the day. Those thick lips, tongue, and throat are all adapted, so they can consume acacia trees and others that have thick thorns. They consume a variety of other foods that are seasonally available like seed pods and apricots. Their tongues are about 18-20 inches long, and they are very powerful and prehensile. They can use them to wrap around things like we do with our fingers and then draw them to them mouth to feed on them. While these giraffes do have a home range, they continue to move along looking for food. While Rothschild Giraffes live in small herds, they have distinctions between the males and the females. They live separate from each other but remain in the proximity. The only time the two gender interact is when they are going to mate. They are tolerant of other animals around them as long as they don’t feel threatened. For the most part, they are very friendly, but the males are known to engage in fights for mating. Since this species can mate all year long, those battles seem to be frequent. However, they aren’t as intense as those from other species. Reproduction can occur with these giraffes when they are about three-five years of age. The females tend to mate years sooner than the males because the latter have to prove among each other who is the strongest to earn the right to mate. After winning a battle neck to neck the males, finally, decide who will have access to the mating female. This particular species does not have a season for mating and can happen all year long. Mothers have a gestation period that lasts from 14 to 16 months, and they give birth to a single calf of about six feet tall. When a mother gives birth, she and her offspring stay away from their groups from 10 days to a month and then return to the herd where the rest of the members accept the new member. The females will nurse the young for the first year of life. They are excellent at caring for their young and use lots of non-verbal communication to teach them. Groups composed of females and offspring live separately from groups of males and only meet during breeding seasons. The bonds between mother and offspring are the strongest within the society, as they try to stay together and in the case of threats, the female attacks the enemies with deadly kicks. Some individuals live in captivity and most of the time have success reproducing, although there is always the debate that a wild animal of such magnitudes should be released. Advocates of these facilities argument that thanks to their conservation efforts, some individuals of this African animal are safe. These giraffes have quite a few predators including hyenas, lions, crocodiles and leopards. These predators will mainly target the young and sick because full grown adults are too much of a risk as their powerful kicks can easily injure or kill such predators. However, while adults can be saved by their strong kicks, if they are the target of a herd of the carnivores mentioned above, their chances of survival are minimal. The young are very vulnerable, and so there is a mortality rate of more than 50%. Poaching of the Rothschild Giraffe continues to be a severe problem. The future for the Rothschild Giraffe is in serious jeopardy at this time. Today there are only around 1500 individuals in the wild. Poaching, traditional hunting, and degradation of their habitat are primary reasons that took this species to an endangered conservation status (EN) according to the red list of the International Union for the Conservation of Nature (IUCN). The latest estimation in 2016 showed an increase in the population but still alarming numbers with an approximate population of 1,671 individuals left in the wild (Fennessy, S et al. 2016). From them, approximately 40% live in national parks and the rest, 60% live in Uganda. Although many are kept in protected areas for their preservation, the problems still prevail, and it is necessary to keep protecting this species, even, in those places where there is surveillance.